Mr Parag Vora is the CEO of PEAS, which is the market leader in producing patient educational materials in India. He provides a real-life demo of a new app called Jugaad, which helps doctors take a medical history from illiterate patients using a simple smart phone app ! 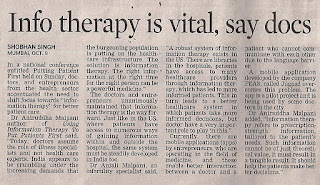 Dr Rajendra Gupta is one of the few experts in India who have a holistic perspective on how we can tackle India's burgeoning healthcare problems by using Information Therapy. He is India's No 1 health policy wonk ; and presents his case as to why the government needs to tap into India's enormous patient power ! Dr Sujit Chatterjee is the perfect hospital CEO, who uses Information Therapy to help make Hiranandani Hospital one of Mumbai's finest hospitals. He speaks passionately on how Hiranandani Hospital empower patients Information Therapy. One of the most frustrating problems to treat in reproductive medicine today is that of recurrent pregnancy loss. This is frustrating for both patients as well as for doctors because we have many questions and very few answers . Because we often cannot determine the reason for the pregnancy loss in an individual patient , we often end up grappling in the dark. What makes matters even more confusing is the fact that this frustrating condition has a surprisingly high spontaneous cure rate ! This seems completely counterintuitive , but many studies have shown that even women with three or four repeated pregnancy losses for unexplained reasons have a better than 75 percent chance of having a healthy baby, even if they are treated only with tender loving care. This means that practically any treatment is likely to give gratifying results. This is why there are so many potential treatments for this problem, and why every doctor swears by their own particular preferred remedy. Since we are not very good at pinpointing what the exact problem is in an individual patient, we are forced to rely on medical experience in order to treat these patients. This is called empirical therapy. There are many kinds of empirical therapy ranging from low-cost treatment with low-dose aspirin all the way to extremely expensive and complicated treatment using intravenous immunoglobulins and lymphocyte immunization therapy. One of the treatment options for these patients is that of IVF. This may seem quite surprising, given the fact that most of these patients have no difficulty conceiving on their own. After all, if they can get pregnant on their own and if the problem is that they cannot carry the pregnancy beyond 12 weeks, then how on earth is IVF going to help them ? What sense does this make ? Interestingly , we do know that the commonest reason for a miscarriage is a genetic problem in the embryo ; and that a miscarriage is usually nature's defense mechanism to prevent the birth of the normal baby. This is why recurrent miscarriages are common in older women. They have poor ovarian reserve, also known as oopause, because they have older eggs which contain more genetic abnormalities because they have aged in vivo. Theoretically it's possible to use IVF to help them to grow better quality eggs and better quality embryos. It's possible that super ovulation , as well as treatment with supplementation such as DHEA , helps to improve ovarian reserve and therefore helps them grow better quality eggs, which are more likely to be genetically normal and give rise to genetically normal embryos. Also, since there is much more aggressive luteal phase support given during an IVF cycle, IVF treatment can help to prevent recurrent miscarriages which are a result of hormonal problems . One of the biggest advantages of IVF is that it allows patients to telescope time. If they continue to try in the bedroom, they would produce just one embryo every month . Whether or not this embryo would be genetically normal is purely a random matter of chance . Doing IVF allows the doctor to superovulate the woman , and therefore create multiple embryos at one time. Since we allow these embryos to compete amongst themselves, we can then select the embryos which grow the best. There is evidence to show that rapidly developing blastocysts have a better chance of being chromosomally normal as compared to slowly growing embryos. For the future, as the technology for embryo biopsy and comparative genomic hybridization improves, we will be able to treat these patients with a much more scientifically sound basis. Doing an embryo biopsy will allow us to identify the chromosomally normal embryos and then selectively transfer only these embryos , thus systematically reducing the chance of a miscarriage because of genetic abnormalities. For now , however , the fact remains that there are still lots of unanswered questions. One advantage of doing IVF is that it helps patients to have peace of mind that they have taken advantage of whatever reproductive technology is available, even though it does have its limitations. All good doctors know that medicine is not an exact science and there are often multiple options to treat a particular problem. It's very easy for a doctor to tell the patient what to do ( and this is something doctors are trained to do all the time), but often this is not in the patient's best interests. However, when the doctor tries to explain the fact that there are options to the patient , and then asks the patient to provide inputs as to what their preferred course of action is, this sometimes creates a lot of anxiety, stress and tension in the patient's mind. For one thing patients aren't used to making decisions like this, so they are often clueless and don't know how to proceed. It's important for doctors to level with patients , and to communicate with them that often there are no black-and-white answers in medicine. Lots of topics are fairly controversial , because medicine is an evolving science. There are often no easy answers to some complex situations. Let's take the case of the patient whom I saw who had a small polyp and required an embryo transfer . Some doctors recommend that the polyp be removed before doing the transfer ; while others feel that a small polyp does not affect the chances of embryo implantation. I explained both these choices to her , and then asked her what she wanted me to do. She was completely paralyzed and kept on insisting that I make the decisions for her , because she felt that I had superior knowledge and more experience ; and would be able to provide her with the " right : answer. When I explained that often it's six of one, half dozen of another she didn't know how to proceed. It is important that we realize that it's not only doctors who have a particular philosophy . While some doctors are quite aggressive, others are conservative. Patients have a certain philosophy as well, and while some will do everything possible to avoid surgery , others are much happier with a quick fix surgical solution. The problem is that often the doctor has no way of knowing what the patient's personal preferences are , which is why good doctors will explicitly ask patients these questions , and factor in their personal preferences , when making such important decisions. It's very easy for doctors to be dogmatic and say - This is the right way to do it ; or to pretend that this is the only way to do it , but this is actually not in the patient's best interest. The patient is then being deprived of the information that there were alternative options available to handle that particular problem. I prefer taking a straightforward approach and explaining the options upfront to all patients, but sometimes this also has the downside of leaving these patients very confused. The important thing is to step back , look at the big picture, and understand why some of these quandaries occur in medicine . When I offer a choice, I also tell them that the very fact that I'm offering them an option means that both options are equally correct from my professional perspective . I explain the pros and cons, and tell them that as their doctor, it's my job as a professional to make sure that I will not let them make a wrong decision ; but when there are options , it's important that they apply their own mind and use their own personal preference system , so that I can factor this in , when helping them to make the right decisions for themselves. When your doctor asks for your opinion, this does not mean that he does not know what to do ! In fact, it means that he is a real expert, who can look at the big picture; understand that there are choices available; and it willing to respect you so that he can factor in your personal preferences before making a final decision. It's only doctors who are insecure who get upset when discussing choices and who deceive the patient by pretending that there's only one right way of doing something in medicine ! It’s true that doctors are bottlenecks. After all the doctor only has 24 hours in a day , and the number of patients whom he can actually see , examine , or talk to is going to be limited. This is especially true for highly skilled doctors because their services are often in great demand and they often have long lines of patients waiting to see them. While this can be very gratifying to their ego, this is not a very efficient use of the doctor’s time – or the patients’ ! One way these doctors can amplify their effectiveness is by employing assistants (physician assistants or junior doctors ) who can help them to process more patients (by taking a history or by doing the initial examination) . Today, they can increase their efficiency and efficacy by using technological tools to achieve exactly the same end. An extremely good example of this is the intelligent use of patient education videos which can be used to counsel patients , and ensure that patients provide informed consent prior to going in for surgery. Often explaining things to patients is not something which a lot of doctors are good at. They find this very boring, repetitive and monotonous , and would rather be doing more interesting things with their time. Cleverly crafted audiovisual tools can ensure that doctors can communicate the information which their patients need , without having to do it themselves. This can be done by using interactive services such as virtual coaches, or health games, which they can also share with other family members. Not only will this free up a lot of the doctor’s time , so that he can then start doing the things which interest him, it'll also ensure that the information which is provided is of high quality . Equally importantly, it allows the doctor to document the fact that this information has been provided to the patient. This way high-quality information, which is complete, comprehensive, and based on sound medical principles can be provided to all patients no matter how many there are. The doctor now no longer acts as a bottleneck , and can use the time freed up to be more efficient and productive. The trick is to spend a lot of time and energy on creating a good video . This can be expensive and time consuming, but once it’s been created , it can be used multiple times . This comes back to the principle of “ create once , use many times “ - something which doctors need to learn to use if they want to reach out to more people efficiently. There is no question that technology can be a two-edged sword. Technology can cause healthcare to become depersonalized – for example, when doctors are more interested in looking at x-rays and reading lab reports rather than laying hands on the patient or talking to the patient . It’s true that today there is too much emphasis on poring over scan images and analysing lab printouts, especially when we have super specialists who deal with organs rather than with patients. This causes doctors to transmit an image of being uncaring and unfeeling. This is why a lot of patients feel that doctors are not very interested in them as people, but are much more interested in the particular pathological lesion or disease which they happen to have. While it's true that technology can cause these undesirable side effects it’s also equally true that technology when used cleverly can help to amplify a doctor’s efficiency and effectiveness. One of the things the doctor needs to do a lot of is patient education and counseling. Sometimes , this is not something which doctors are good at – and many are not very interested in doing this either, as they feel it’s basic , boring and simple. It's in these situations that doctors can intelligently use patient educational videos, many of which are now available online , so that they can empower their patients with information , without actually having to go through the nuts and bolts of what's wrong with them personally . Not only does this save a lot of time for the Doctor , it also ensures that the patient absorbs and retains the information much more effectively , because it's been crafted in an audiovisual format which is much more memorable. It also allows the doctor-patient conversation to then proceed at a much more highly evolved plane because the patient already knows the basics and can now focus only on the points which are of special concern to him. This kind of intelligent use of technology helps to increase patient satisfaction - and the doctor’s professional satisfaction as well. Mr Ankit Khambatti is a very successful medical entrepreneur and CEO of CheenyKum. He talks about how his company is using SmartPhones and mHealth cleverly to promote Information Therapy to help keep diabetics healthy ! The whole point of the electronic medical record is to allow the doctor to capture, store record and retrieve the data when he needs it afterwards - not while he's talking to the patient . A well-designed electronic medical record system should allow the doctor to look at the patient , talk to the patient , examine the patient and then record his findings later on , rather than instead of talking to the patient. The HSG ( hysterosalpingogram, X-ray of the uterus and tubes) is one of the commonest tests done for evaluating the fertility of a woman . It is done to confirm that the uterine cavity is normal and the fallopian tubes are open. What makes this test special is the fact that it is only done for one reason - to test the fertility of a woman. However, since it is only done for infertile women, this means this test if often misinterpreted. Let me explain. Many women have minor anatomic variants of their uterine cavity . A common example is an arcuate uterus ( in which the upper border of the uterine cavity is curved rather than straight). An arcuate uterus is something which many fertile women have as well. However, neither they nor their doctor knows they have an arcuate uterus, because they have enough sense not to get a HSG done. This means that the only HSGs a doctor sees are HSGs done for women who are infertile. Because of this , every time the doctor sees this finding, he chooses to (mis) interpret this as an "abnormality" and happily jumps to the conclusion that this is the reason for the infertility. The doctor is happy, because he has made the right "diagnosis" and found the problem ! The patient is happy too, because she feels she has finally found a very competent doctor , who has been able to diagnose the cause - something which all the other doctors had overlooked . This diagnostic acumen testifies to his superior skills and competence. The trouble, of course, is that this minor anatomic variant is of no clinical importance and does not affect fertility at all ! However, the minute the doctor finds the '" problem" , he needs to treat it. Overdiagnosis leads inexorably to overtreatment, and many of these patients end up being subjected to useless procedures such as hysteroscopic metroplasty, which can actually end up reducing their fertility ! Feedback from the audience at the Putting Patients First Conference ! The HELP conference on Using Information Therapy to Put Patients First was a big hit ! One of the clever innovations the compere, Mr Rajesh Jain introduced was a mobile application which allowed the audience members to provide comments and feedbacks during the lectures by sending messages ( SMses) using their phones. These messages were then displayed on a screen, and the speakers could reply to these in real time. The great thing about this clever innovation is that it encourages audience interactivity and participation, using only their personal phones ! No investment in expensive hardware is needed. This is the kind of clever technology which will help to make conferences more meaningful for the audience ! Here is a sampling of some of the SMes we received during the conference. This kind of feedback allows the audience to engage with the speakers; and will help us to do a better job for our next conference ! I liked the varied information provided. The sessions could be better connected. The theme of the conference is really great and very relevant. It was nice to get so many people talk on different issues. The time clock and online sms and web cast is a great idea. The Mode Of Delivery Of Information Therapy Should Change From Passive To Aggressive and Active. Instead Of Waiting for The Patient To Ask, Institutions Like HELP Should Reach Out. Right to Information has definitely empowered us largely by an Act of GOI but still it is not a Fundamental Right. Therefore it has limited deterrent effect. Unless this information therapy for patients is made a FUNDAMENTAL RIGHT every effort by like minded people striving hard in this direction would be futile. Comment= All pharmaceutical company provides info along with medicines are in a very small letters - people can not read easily without magnifying glass!!! There is a very thin line between right to information & patients getting depressed by info given to them. Who will decide whether info passed on won’t harm the patients ? Do we require a healthcare regulator in India? Many doctors are Information Literacy challenged. How are they going to educate people? Given the extent of illiteracy, lack of resources and load sheds in India, how do u thing info will reach out to the patients. Using Information therapy to put patients first will require this to be a part of the standard operating procedure ( SOP) to be implemented among doctors and support groups . How can this be done ? What can be done about information therapy in public hospitals? The high patient load makes it impossible to have a good doctor-patient relationship. How to address the problem of patients who claim that patient information will scare us. How does one draw the line between adequate and too much information? Every doc has his own opinion. For some doctors, a particular medicine works best for a particular disease according to his experience ; and for others, it would be a different one for the same disease..Which opinion should we trust?? When Government spend on health care is a minuscule % of GDP is it important to spend on ensuring basic health care in non urban areas or Information Therapy? Do Doctors always educate patients with all the alternative methods of treatment clearly informing about the time for the treatment and costs? Do patients really want to know EVERYTHING about the disease and treatment? It ensures that they have realistic expectations of the treatment. 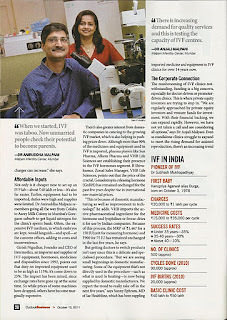 They understand that no matter how good an IVF doctor I may be, the success rate is never going to be hundred percent. Even if the IVF cycle fails , if they have a clear understanding of the process , at least they have peace of mind they got the best possible medical treatment. When patients take the time and trouble to become experts, it helps me to maintain my expertise and my professional edge as well. Because they're well informed, they keep me on my tools by asking me challenging questions which I do my best to answer. Expert patients can be the best form of continuing medical education for a doctor ! All good doctors learn medicine all the time from their patients and well informed patients can do a much better job of teaching their doctors ! Expert patients and expert doctors can help set up a positive virtuous cycle , which allows both of them to keep on improving all the time. As part of my professional responsibility as a doctor, I need to create and provide tools to my patients to enable them to learn for themselves. After all, the word doctor is derived from the word “docere” , which means “ to teach” . While it does take time, effort and money to create these tools, once they've been created they can be used multiple times , making them a very cost-effective investment of my time and energy. Of course , I still have to draw the line sometimes. I am the doctor, and am in charge of providing the medical treatment and it’s my job to make sure that I do not allow patients to make a decision which I feel can harm them, no matter how expert they may be ! Creative Commons License for our free online book ! My book, Using Information Therapy to Put Patients First is licensed under a Creative Commons Attribution-NonCommercial-NoDerivs 3.0 Unported License. Based on a work at www.slideshare.net. 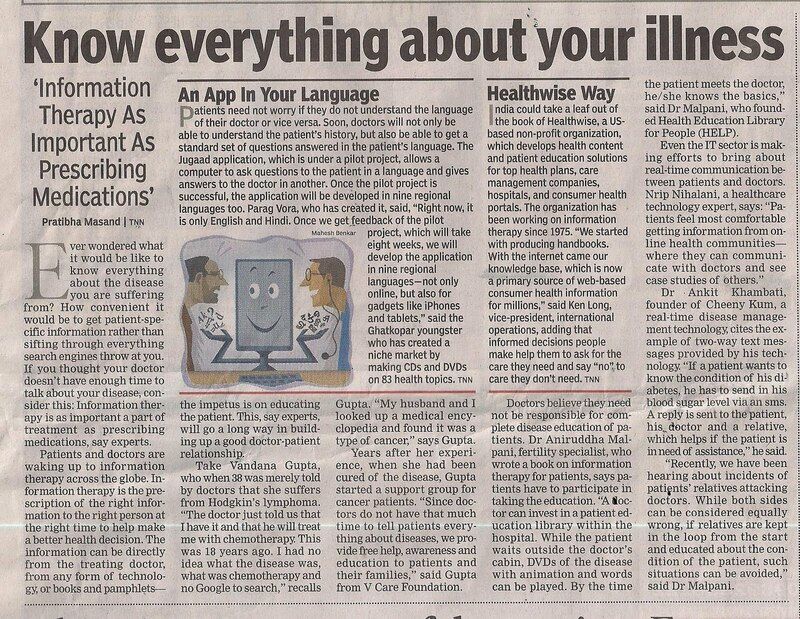 This is the Asian Age Report on the HELP Conference on Using Information Therapy to Put Patients First ! 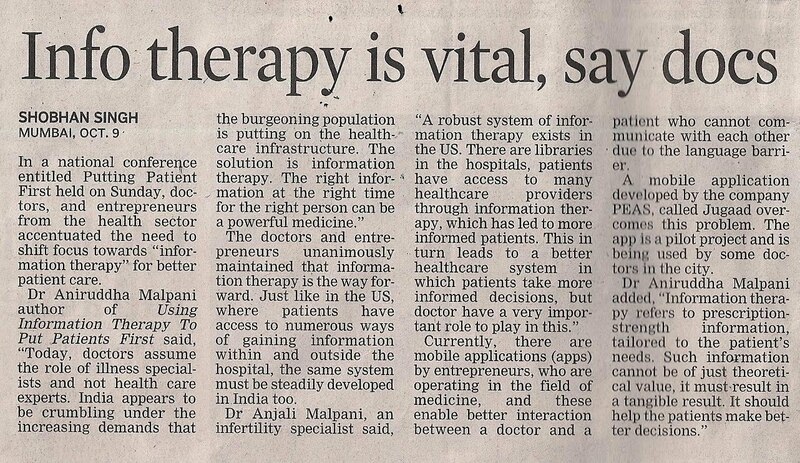 This is the Times of India report on the HELP Conference on Using Information Therapy to Put Patients First ! When my colleague informed me about the Patient first Conference organized by the HELP library, I was not sure whether I would find enough information about the topic. However once I started my research for the presentation I found a plethora of information. So much has been written about it in articles and research papers all over the world but very little of it is being implemented in India. 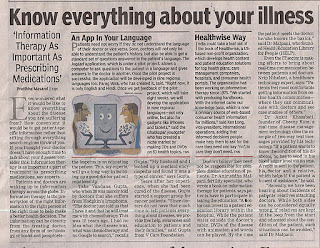 Once I started collecting the background data, I realized that it is something which we doctors can and should or rather ought to inculcate every time we communicate with the patients. Working as an intern and now as a junior resident/houseman in a Tertiary Care Centre and a Government hospital I come across a number of patients every day, from all sections of the society. These patients are already crippled by their illness. To make things worse the lack of information paralyses them. Just imagine if you are thrown into a complex maze with people speaking any random foreign language with no shelter and a meager sum of money. To add to it you have been left helpless with some kind of deformity and people around don't really care who you are and why are you here. That is what a Bengali/Assamese or any other vernacular patient goes through every day when he visits a Government hospital in Mumbai, or probably worse than this. So through my presentation I have tried to highlight the same point that Patient Information should be delivered to the right people at the right time and in the right way. I would like to thank Dr Malpani and the entire team at HELP library for giving us an opportunity to voice our opinion and setting up such an amazing event. All of us will be patients some day. What can we do to ensure that we get the best medical care when we fall ill? This book explores how Information Therapy impacts all players in the healthcare ecosystem – patients, doctors, hospitals, health insurance companies, pharmaceutical companies, and the government – and how it can help all of us. Information Therapy can help to heal a sick healthcare system – and everyone has an active role to play in making this a reality! 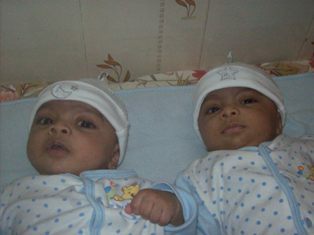 Twins are twice as nice - a success story in Oman ! I am 32 years old and my husband 36 years old. We got married in December 2005. For one year after getting married we didn’t really get a chance to stay together because my husband was working in Oman and I was in Mumbai. I joined him in Oman in 2007 and it’s from then that I had been trying to conceive. We met a few doctors in Oman and also in Mumbai but no one could give a solution to our problem; they just kept prescribing some medicines which did not help us. We were losing patience and could feel a vacuum in our lives, but we kept faith in God and continued to pray. 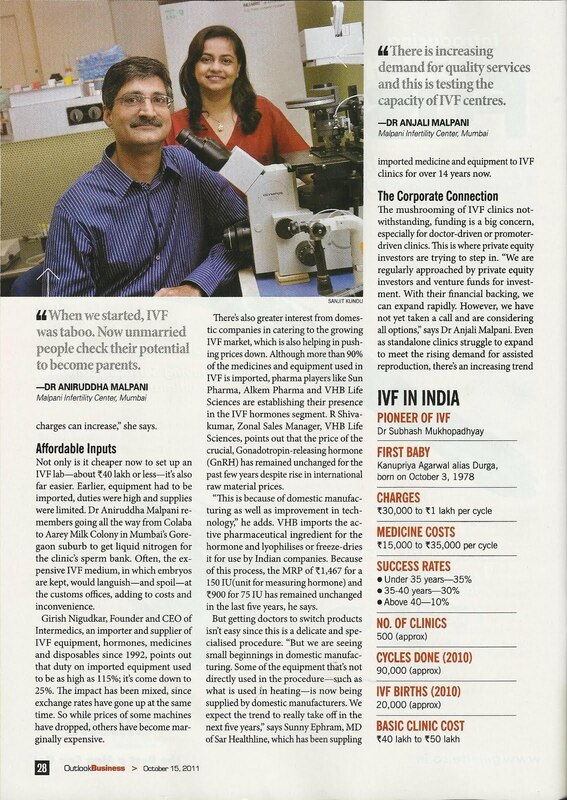 One day my husband came across an article in a health magazine and that’s how we came to know about Dr. Malpani. We emailed our test reports to doctor and were advised to go for ICSI treatment. My husband and I came to Mumbai in June 2010 and the treatment started, unfortunately it didn’t work for us,it was very depressing but, Dr. Malpani didn’t let us lose hope and we decided to go for a second attempt. The treatment started again in September 2010, by end of the month we were back in Oman and the most awaited day i.e. the day of BHCG test arrived. The test was done and the result was positive, we immediately called doctor to give him this good news and he said that it might be a multiple pregnancy;since the HCG level was on a higher side. The same test had to be repeated twice on alternate days and it was confirmed that it’s a healthy pregnancy and the scan report showed two little hearts beating. God answered our prayers through Dr. Anirudh and Dr. Anjali and blessed us with the happiness of parenthood. Our twin baby boys are now 5 months old. My husband and I thank Dr. Anirudh and Dr. Anjali from the bottom of our hearts and also the cheerful and friendly staff of their clinic for their prompt and excellent service. Conference on Using Information Therapy to Put Patients First ! Our conference is tomorrow on Sunday, 9 Oct at 10.30 am at Hall of Harmony, Nehru Center, Worli. So why should you attend ? What makes this conference different ? 1. We have lots of clever speakers , covering many unique points of views. Of the 10 speakers, only 2 are practising doctors , and this highlights the fact that we are approaching this topic with a completely different and new viewpoint ! 2. We want this to be a platform where different participants can get together to work for the good of patients ! This can be used to cover many burning issues, including patient rights ; medical ethics; and health literacy. While work has been done in these fields in India, it's been very scattered and disorganised. 3. We want this conference to act as a catalyst , to spark off unexpected and novel interactions. These have to be unplanned, as we cannot predict what will work and what will not, which is why we have a lot of time for audience interaction and participation. Please come and grill our speakers ! 4. A lot of what will happen in the conference will be captured live on our website at www.patientpower.in, so that the conversation keeps on growing, even after the conference is over ! Ketan Shah, a sales representative for a major heath insurance company, has his work well cut out. The senior management has asked him to maximize sales of insurance policies to keep the company ahead of its rivals. Yet, this is a very shortsighted approach. Instead, if the company looked beyond the obvious profit motive and directed its efforts towards ensuring the health and well-being of its clients, this would not just attract more customers and increase revenue, but also build lasting relationships. Providing Information Therapy to their customers makes a lot of business sense ! No one wants to fall ill, but when you do, the last thing you want to worry about is the doctor’s bills. This is why purchasing a health insurance policy to protect yourself against the financial losses caused by a medical problem has become so important. Medical care has become increasingly expensive and unaffordable and a health insurance policy can provide financial protection and ensure you can afford the best medical care. The traditional form of health insurance is called indemnity insurance (also known as fee-for-service), in which the insurer pays for the cost of covered healthcare services after they have been provided. In most indemnity insurance plans, the patient is free to choose his own doctor or hospital. In the past, the health insurance business in India was a monopoly, so the only medical insurance policy available for most of us was MediClaim, through the subsidiaries of the General Insurance Corporation (GIC). Today, with increasing liberalization, the insurance business in India has been opened to the private sector, and there are now many more options to choose from. While this extra choice is great, because companies are competing with one another to offer customers the best deal, having so many options can be confusing! Given the huge Indian middle class; the fact that medical care costs are escalating every year; and that the government infrastructure is not able to provide basic healthcare, experts believe that the health insurance market is going to boom over the next few years. However, for historical reasons, most health insurance companies in India are still losing money and scrabbling for market share. This is actually a great opportunity for a health insurance company which is willing to think out of the box to stand out from the crowd. With IRDA mandating health insurance portability , this is going to become even more important now ! What do customers want from a health insurance policy? Their basic needs are: protection from financial loss because of hospital bills; free access to doctors and hospitals they want to go to; no fine print for exclusions; reasonable costs; convenience at the time of hospitalization so they don’t have to pay first and then claim the money from the company (what is called a ‘cashless’ transaction); prompt payment of medical claims; quick processing of claims; minimal paperwork; and friendly customer service. Today, because there are so many companies competing for business, they all have great marketing campaigns and are happy to sign up customers left, right, and center because they want to increase their market share and they know that once signed up, most customers usually stay for life. However, most Indian health insurance companies are still stuck in the past when their only role was limited to paying the hospital bills. All they seem to do is collect the premium every year and pay the medical bills (claims) when customers fall sick and need hospitalization. What’s worse is that while they are very efficient at collecting the premium, when it’s time to pay out the claims and settle the hospital bill, they create a lot of unnecessary hurdles in order to delay making the payment, causing a lot of grief and anguish to the customer . This is why health insurance companies have received so much bad press recently. This is shortsighted. Remember that a health insurance policy should not just provide illness care, but should also help us to remain well. In the USA, which has the most evolved health insurance market, things are very different. Insurance companies have realized that spending on medical care after a person falls ill is expensive for them. It’s much more cost-effective to invest money in educating, counseling and motivating people to remain well, so they do not fall ill in the first place - after all, prevention is better than cure. In fact, in ancient India, this was a well-accepted principle and the doctor (whose job was to keep the family in good health) was paid only as long as everyone was healthy. If anyone fell ill, the payments stopped, until they recovered. Innovative health insurance companies in India need to come up with a modern version of this model - and providing Information Therapy is a great way of doing this. There are many options now available to insurance companies which they can use to help their customers remain healthy. These include tools for counseling; lifestyle improvement; weight loss; and smoking cessation programs. Many of these can be provided online on the web, which makes them inexpensive to deliver. Just look at the wellness tools which the United Healthcare website at http://www.uhc.com/health_and_wellness.htm offers to its US customers; or the Aetna website at http://www.besmartaboutyourhealth.com! And compare this with any Indian health insurance company website. The difference is clear. Indian health insurance companies need to leapfrog and use the web to deliver Information Therapy to their customers. Most affluent Indians are now online and because it’s so inexpensive to develop web services and applications in India, it’s very cost effective for insurance companies to deploy these. Once they have the email addresses of their customers, they can encourage them to submit their claims and pay their premiums online – again saving both the insurance company and the customer time and money. They can also offer discounted memberships to gyms, spas, yoga classes, meditation retreats and counseling sessions, to help their customers take a proactive approach in managing stress and fighting off disease. Similar tools can be used to help patients with chronic illnesses manage their disease better so they don’t need hospitalization. Hospital care has become very expensive and teaching patients to take care of themselves is a powerful therapeutic intervention. This is called ‘disease management’ and is an integral part of providing Information Therapy. It has been applied abroad for a wide range of diseases, ranging from asthma to hypertension to diabetes. These programs are cost-effective for the insurance company to offer – and they don’t need to spend too much on them either. An excellent example is the recent study from Partners Health Initiative (PHI) in Anderson, South Carolina which showed they saved an estimated $34.5 million in 30 months—thanks to simply gifting a copy of the world’s largest selling patient education book, the Healthwise Handbook, to all their customers! The lesson is clear - not only is there a business case for health insurance companies to be investing in Information Therapy, but it’s also a great way of helping them win more customers and keeping their customers happy. Knowledgeable customers should demand that health insurance companies provide them with Information Therapy tools to promote their health.
" What's happening now to American physicians is the result of a long-term cultural shift in the way society views you and your role in public life. Physicians, America has demoted you. Previous generations saw you as vital experts offering crucial advice and service to individuals and families, mostly via the private sector. Today, doctors are viewed as anonymous "providers" in a healthcare system that is better understood as a quasi-public utility than as a private industry." This is equally true in India as well. While patients may still look upto their personal physician, the medical profession is no longer held in the high regard it used to be. Physicians are partly to blame, because we have failed to take a leadership role and have allowed ourselves to be bashed up and bad mouthed. The tragedy is that all of us will pay the price for this - not just the doctors . When you become a patient you will find it hard to trust your doctor ! What this means is that customers can now switch their Mediclaim health insurance policies. This is good news for customers, because it will force health insurance companies to become more customer friendly and more patient-centric ! Hopefully, more of them will now invest in providing their customers with Information Therapy ! Here's a success story from one of our patients. There are still lots of myths and misconceptions surrounding IVF in India, and these first hand accounts help to dispel many of these. I and my wife come from a middle class family from Pune. We have been married for 5 years and have been trying to conceive baby for 3 years. Around two years back I was diagnosed with Asoospermia. This news was heart breaking especially when we came to know that this situation cannot be reversed. We visited lots of doctors and there was positive outcome of any visit. Things were very painful specially when see friends of the same age having babies and people asking us. We thought now there is no chance to have baby at least in the life and thought of going on with the life. But suddenly realized that things are not going to be good given the fact in India it is very important for a couple to have baby. Parents/relatives/friends kept on asking and we kind of tried to kept it away. One day I was researching on the internet on this situation and came across Dr. Malpani website. Went though the website and thought of giving it last try we scheduled the appointment with Dr. Malpani. So, we first visited Dr. Malpani in March and we were pretty much impressed the way doctor explained the various options we had to conceive a baby. Since we had already decided to have a baby, we decided to go with the option of IVF/TESE. We had our first IVF which didn’t go very smooth the way doctor would have liked. Doctor found out some complexity while doing the embryo transfer but still Dr. Malpani did successfully transfer the embryo. So, now started the waiting for next couple of weeks to wait and see the results. Unfortunately, the results came negative and it was heart breaking. So, we thought of giving it a one more try and visited doctor one more time. Earlier during first IVF Dr. Maplani suggested to freeze the embryos which was an excellent idea since in the next IVF the cost and medical process is much simpler in the next IVF cycle. Also, since there was some complexity during the first IVF cycle, Dr. Maplani suggested the approach of ZIFT technology to transfer the embryo. This is a pretty modern technology that only very few doctors can do it today and Dr. Maplani already had the expertise towards this. Also the chance to achieving pregnancy goes high with ZIFT. So, my wife went through ZIFT embryo transfer in the second cycle. This time things went the way doctor was expecting and the minor operation went very well. So, again the waiting time started for the next couple of weeks. The first pregnancy blood test came out positive and we couldn’t believe it finally happened to us also. After that the second blood report also came positive. My wife is now four month pregnant and we are looking forward to a healthy baby. I forgot to mention about the clinic staff in the above paragraph. Let me tell you something, I have never-ever seen a good medical staff as Dr. Maplani clinic. They were so good and made us comfortable and helped us in every aspect. We would like to take this opportunity and thank all of the staff members and also Dr. Aniruddha and Anjali Malpani for all of the happiness that they have given in our lives. Anybody who is reading this story, I would like to recommend at least to meet Dr. Maplani once before they meet anybody other doctor. Finally the dream came true of having a baby came true. Please see this video - it gives us a sense of what the future holds for healthcare when clever people starting applying their minds ! “We are at a moment in time in healthcare where we have an opportunity to rethink how we serve patients.” —Kai Worrell. This video documents their exploration of one potential care model for a patient centric future.